Learn about the Young Democrats of Washington! And, of course, to have fun in the process! YDWA has above all one goal: to get people under 36 involved in the Democratic Party. We accomplish this through voter registration, encouraging voting, organizing and bringing young people to the Democratic Party. We hope to provide a strong basis for the party’s future. We work to identify issues of importance to our members and other young people. We coordinate petition drives, rallies, letters to the editor campaigns, and other lobbying and public awareness efforts to draw attention to them. We hold issue forums and educational workshops, develop our own platform and resolutions, and make our positions known to state leaders and the general public. Young Dems actively participate in our communities. We conduct voter registration drives, get out the vote campaigns, and work on community service projects. We support Democratic candidates and initiative-related efforts by giving our time and energy to their campaigns. During election season, Young Democrats can be found walking precincts, working phone banks, stuffing envelopes, managing campaigns and even running for office themselves. Although the work of the campaign volunteer isn’t always glamorous, it is crucial to a campaign’s success, and it’s a great opportunity to meet and bond with other Democrats. YDWA and chapter sponsored trainings give young peopel the opportunity to learn about campaign techniques, grass roots organizing tactics, and the state party structure. Members take their skills practical applications and learn how to plan projects/events, implement projects, tailor a message to the audience, motivate people, build coalitions, and orgnaize. Whatever your professional or personal goals may be, the skills you’ll gain through your involvement in Young Democrats will be invaluable. Young people who haven’t learned the ropes often feel intimidated by the state and local party structure. YDWA is a good place for newcomers to Democratic politics to learn how the system works from their peers who’ve been involved in the party for a while. By working together, we can ensure that party policies are youth-friendly and the state party platform reflects our values. 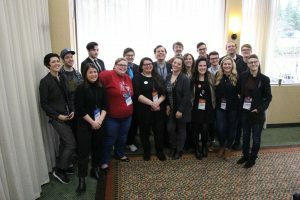 Despite having a strong, centralized state-wide organization, the Young Democrats of Washington is primarily composed of local clubs (chapters) throughout Washington state. Chapters can exist in a high school, college campuses or can be county wide. Each club chooses its own leadership and sets its own agenda, but must meet certain criteria to charter with the statewide organization. To find a chapter near you, see our Chapter List. If there isn’t a local chapter in your area or on your campus, consider starting one. The state-wide organization is composed of more than two dozen elected and appointed officers with various areas of responsibility. The President is responsible for overseeing the administrative aspects of the organization and directs the work of the other officers. Officers are elected annually at a state-wide convention by the general membership of YDWA. The YDWA Executive Board meets monthly to coordinate the day-to-day operations of our organization and each of our committees. The Executive Board includes the President, the Executive Vice President, the VPs, the National Committeeman and National Committeewoman and the WSDCC Representative. The Chair of the YDWA President’s Council serves as a non-voting member of the Executive Board. The General Board of YDWA serves as a ‘state committee’ and meets at least quarterly to oversee all aspects of the state-wide organization between annual conventions. The General Board is composed of a representative (usually the President) from each chartered club, as well as all of the statewide elected officers. The General Board develops statewide initiatives, provides fiscal, administrative, and other support to chapters, coordinates fundraising and outreach efforts, and performs a number of other duties. The Young Democrats of Washington recently adopted a caucus structure. Our caucuses are Women, Diversity, Queer, Religious, Labor, and Environmental Affairs. The caucuses meet at least quarterly and periodically hold events. The voting membership of each caucus is a representative from each chartered chapter, but all members of YDWA interested in the issues of the caucus are welcome to join! If you are interested in joining a caucus, please contact the chair or follow them on their facebook page! 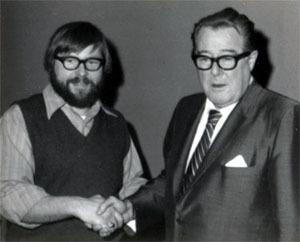 The Young Democrats of Washington (YDWA) was founded in 1932 by Senator Warren G. Magnuson. On March 4 – 5, 1932, the first national meeting of Young Democrats was held in Washington D.C., with delegates from 27 states and the District of Columbia present. One of the first articles of agreement stipulated there should be no distinction in membership and privileges between men and women. Since its inception, YDWA has remained an active force in Washington politics and continues to grow and expand today. YDWA is nationally recognized as a leading state-wide YD organizations, and we consistently set the agenda for the Young Democrats of America (YDA), one of our parent organizations. Many of our state’s own leaders like Dean Nielsen, Jason Bennett, Jody Buckley, James Apa, Joe McDermott, Natalie Reber, Aaron Ernst, and Jessica Knapp have played key leadership roles within both YDA and YDWA, and we continue to be a major guiding force today. Over the years, we’ve produced some of Washington State’s greatest democratic leaders – men and women who have become powerful advocates for environmental stewardship, protecting personal freedom, expanding our economy and creating new jobs, protecting a woman’s right to choose, and countless other principles that we hold dear. Some of the leaders we’ve produced include Governor Mike Lowry, Congressman Don Bonker, State Auditor Brian Sonntag, former State Party Chairman Paul Berendt, State Representatives Sam Hunt, Derek Kilmer and Brendan Williams, Seattle Mayor Greg Nickels, and Seattle City Council Members Judy Nicastro and Heidi Wills. Many other current and former elected officials have been members of the Young Democrats of Washington. In an effort to learn and document more of the history of our organization, we started the YDWA history project in 2006. Please check back with us as we post stories, documents, pictures, and any information we can glean about the Young Democrats of Washington from 1932 to present. If you have stories, pictures, or anything you’d like to share with us about some part of YDWA’s 75+ year history, please contact YDWA President LaKecia Farmer at president@ydwa.org. First off – thank you for all of your hard work and congrats on all of the recent wins here in WA State and across the country this year. I work as the electoral/legislative organizer for the Alliance For Gun Responsibility based in Seattle. This year for the 2018 legislative session we are working hard to make gun violence prevention and priority in Olympia and hopefully pass a few laws as well. I would love to plug the young dems in and see if anyone would like to join us in Olympia or use some of our online tools to contact their legislators. What is the best way to go about plugging y’all in? My phone number is 248-709-9050 (if it’s easier to chat over the phone).